We live through our nervous systems. By removing nervous system interference, chiropractic adjustments address the cause of ill health — noninvasively, and without drugs. There is a long list of conditions that chiropractic adjustments can help, including ADHD, autism, asthma, allergies, ear infections, headaches, and sciatica. Regular chiropractic adjustments can also help women have healthier pregnancies and easier childbirths. Sensory Processing Disorder is a condition in which the brain has difficulty receiving and responding to data (information) that arrives from the senses. Adjustments can ease the root cause of this disorder. In addition to treating many specific conditions, there are a number of indirect benefits that result from chiropractic adjustments, including reduced stress levels, less anxiety, increased focus, improved energy, and better rest. Some practice members report that they dream more vividly, which they find enhances the quality of their sleep. Every person is unique, and treatment at Health Zone Chiropractic is tailored to your individual needs and goals. In the Restoration phase, the goal is to restore your health. Adjustments typically occur at least weekly (often more frequently) during this phase. Once good health is achieved, you will enter a Wellness phase, so that your results can be maintained. In this stage, the frequency of adjustments varies by individual, and can also change based on the time of year (for example, cold and flu season can increase the need for adjustments). We find that changes in our practice members’ stress levels as a result of what is happening in their lives also influence the frequency of adjustments. Massage therapy, another of our services, may be recommended to you in conjunction with the Wellness phase adjustments. Because no two patients have the same needs, we provide individualized care. 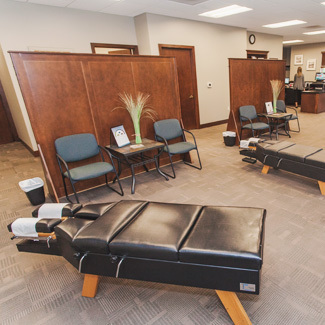 Book an appointment today at Health Zone Chiropractic in Grand Haven!